Trying to find the right words to put into 90th birthday wishes for your loved one? 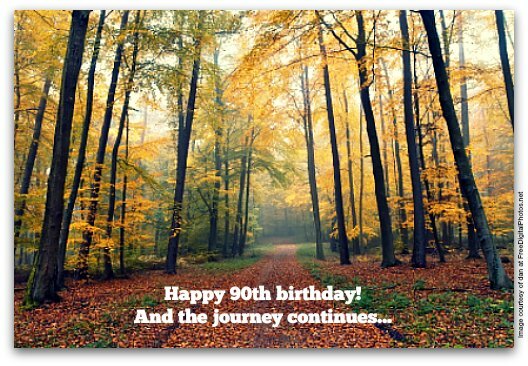 Great 90th birthday messages have one thing in common: beautifully written birthday verses with a deep respect for men and women who have reached one of the biggest milestones in their lives: their 90th birthday. Respect comes in many shapes and sizes, but there's only one way to show your respect for your loved one turning 90: generally, you need to tell him or her that your life has been enriched by his or her love, kindness, attention, spirit, wisdom, devotion, you name it. Fortunately, "great" birthday wishes for 90 year olds are in great supply here. Happy 90th birthday! Wishing you a special day that celebrates everything about your life, paying the ultimate tribute to your nine decades of trials, tribulations, triumphs and tales. Happy 90th birthday! You've lived a lifetime of beautiful moments and memories. May the years ahead be filled with more beauty. Happy 90th birthday! It's such an honor and privilege for me to celebrate your heroic deeds, your extraordinary generosity, your little acts of kindness and your tremendous heart behind it all. Learn what drives active 90 year olds! 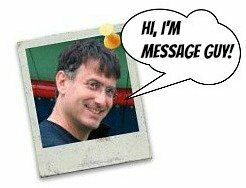 It may help you pick a great birthday message! Dancer and musician Phyllis Sues loves life at 90. Click here to read her article right now and find out why — it may help you find an amazing birthday message for your 90-year-old birthday girl or boy. Let's have a celebration for this special birthday. Let it be filled with wonderful memories and tributes! Happy 90th birthday! Happy 90th birthday! Today is your 90th special day! Let's make it 90 times more special than your first. Turning 90 is a milestone that many may never know. You have...in your own special way! Celebrating your wonderful life and times — and everything you love — is a true honor for me. Happy 90th birthday! You have been a remarkable person every moment of your 90 years in this world. You have spread happiness and joy every day of your life. 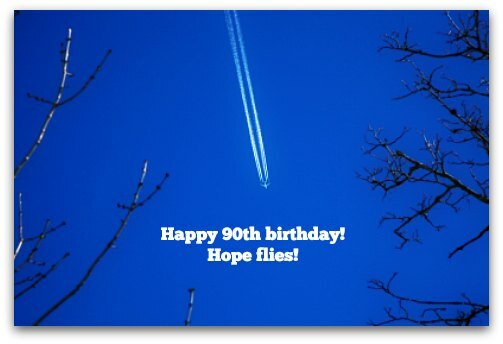 You deserve the happiest of 90th birthdays! Happy birthday! Your 90th birthday means you'll have 90 candles on your birthday cake. This bright, beautiful light show is only fitting, since you've always been a bright, beautiful beacon of light for everyone you've touched all these years. Happy 90th birthday! May the irreplaceable, unforgettable souvenirs from your incredible 90-year journey give you joy, peace and comfort for many miles more. May your 90th birthday be filled with the voices of everyone you love (and who love you), singing "Happy birthday!" Even after nine decades of ups and downs, you continue to light up everyone's lives with your “joie de vivre (your joy for life)! Happy 90th birthday to the most inspiring, most cheerful person I know! Happy 90th birthday! All 90 candles on your cake are a testament to the power of your love and kindness. You've brought so much happiness, in the truest sense of the word, to so many. You amaze me. On your journey through life, you've navigated twists and turns, never steering clear of any adventure along the way. Today, your family and friends, your fellow travelers, have the pleasure and privilege to celebrate what drives you: your immense spirit. Happy 90th birthday! The only constant after 90 years of life is change, glorious change. May life's unexpected pleasures, both great and small, continue to bring you tremendous love, joy, peace and health. Now that you're 90, you should know that there are so many people who absolutely adore you! You are truly fantastic! Happy 90th birthday! May you only know the strength, love and support of your family and friends for many years to come. Have a wonderfully delightful 90th birthday.